H-pipes are currently available again from the US, in either stainless or mild steel. 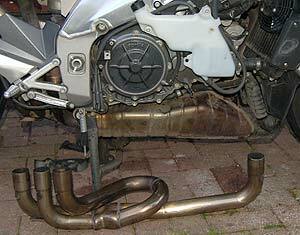 Info is available from this thread on the Apriliaforum: Futura H pipe order information. 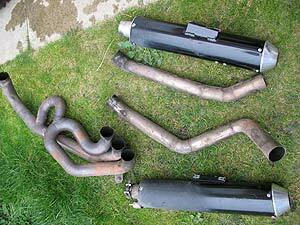 The pre-silencer, also known as the breadbox or pre-muffler, sits under the engine and houses the catalytic converter. It acts as a collector box for the exhaust gases before expelling them to the rear silencer. It’s held in place by springs on the pipes and a single bolt to the rear of the engine. If this develops a hole it can be welded relatively cheaply. Some have modified it by cutting it open, removing the catalytic converter and welding it up again, but the consensus appears to be it’s not worth doing. It liberates very little power and the exhaust note hardly changes. Another option is to replace it. There are two options, and one of them is only available second hand. The AF1 h-pipe was made in batches in the US and was developed to work without changes to the fuelling. Up until early 2009 It could be bought new from AF1 in the US. However the last of the latest batch has sold out and AF1 will only make more if the demand is there. Currently it is not available on their online store. The h-pipe is made of quality stainless steel but the brackets the springs hook on to are mild steel and prone to corrosion, especially if you ride in a wet climate. If you’re buying second hand, check the condition of the brackets. AF1 claim their h-pipe increases power and it certainly feels like it does, with usable grunt coming in from at least 1,000 rpm lower than stock. It also weighs less than half the original and this has a minor – but noticeable – effect on handling, making the bike feel more top heavy. You soon get used to it. You can use an h-pipe with a standard end can or with aftermarket ones. Some owners don’t like the H-pipe and standard can noise, and I have to agree after trying this set-up and ended up putting the breadbox back on. I was fed up with an annoying flat spot, but mostly with people telling me my bike sounded sick! The second option is the Bef H-pipe, which came as part of the Bef full system. Only a few full systems (including bigger bore link pipes) were made but they seem to crop up for sale on auction sites quite often. The system pictured came up for sale on e-bay in 2007, and Bef endcans (much more common)come up for sale quite often. If you manage to get hold of one of these systems, you might find this installation guide useful. Instructions can also be found on Befbever’s site in the Futura folder. Procedure is the same for both types of h-pipe and is pretty straightforward. You need to put the bike on the centre stand and remove both middle fairing panels and then the lowers. Then unbolt the right footrest hanger and brake reservoir. I used cable ties to hook it to the frame, making sure it stayed upright. The pre-silencer is attached by an exhaust spring either side of the front downpipe, and three at the back. It’s also secured by a 17mm bolt at the rear, something that’s easy to miss. Undo this and the pre-silencer should come free with the gentle and well-placed help of a rubber mallet. If you don’t mind the fright of your life when you start the bike, then spray something like WD40 to around the ends of the h-pipe to lubricate them..
Then offer up the h-pipe and fit the h-pipe. This is one of those jobs where an extra pair of hands to hold the pipe in place, otherwise it’s very fiddly as the pipes are a tight fit. Once the pipe is on, fit the front spring then put a jack under the rear pipe junction and gently raise it – you’ll be surprised at how far the pipes need to slide into the link pipes. Be very careful jacking the bike up until the exhaust has fitted together as it will suddenly start to lift the bike off its stand. Now gently let the jack down and fit the rear springs. It’s a good idea to put the footrest back on before starting the bike up. And if you used WD40, remember the bike will start smoking when you start it!